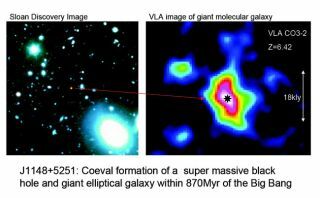 VLA image (right) of gas in young galaxy seen as it was when the universe was only 870 million years old. LONG BEACH, Calif. ? Astronomers may have solved acosmic chicken-and-the-egg problem: Which came first ? galaxies or thesupermassive black holes in their cores? For severalyears now, researchers have known that galaxies and black holes musthave co-evolved, with budding galaxies feeding material to a growing blackhole while the immense gravity of the black hole generated in its vicinitytremendous radiation that in turn powered star formation. But the scientistshadn't pegged the starting point. "Itlooks like blackholes came first. The evidence is piling up," said Chris Carilli ofthe National Radio Astronomy Observatory in New Mexico. Carilli presented histeam's findings here today at the 213th meeting of the American AstronomicalSociety. Previousstudies of nearby galaxies revealed an intriguing link between the masses ofthe black holes at their centers and the mass of the central"bulge" (a mass of tightly packed stars and gas) in the galaxies:The black hole's mass is always about one one-thousandth the mass of thesurrounding bulge. The ratiois the same for galaxies of all ages and sizes, whether the central black holeis a few million or many billions of times the mass of our sun. "Thisconstant ratio indicates that the black hole and the bulge affect each others'growth in some sort of interactive relationship," said study team memberDominik Riechers of Caltech. "The big question has been whether one growsbefore the other or if they grow together, maintaining their mass ratiothroughout the entire process." To helpanswer this question, Carilli, Riechers and the rest of their team used the VeryLarge Array radio telescope in New Mexico and the Plateau de BureInterferometer in France to peer back to near the beginning of the universe,thought to be 13.7 billion years ago, when the first galaxies were forming. "Wefinally have been able to measure black-hole and bulge masses in severalgalaxies seen as they were in the first billion years after the Big Bang, andthe evidence suggests that the constant ratio seen nearby may not hold in theearly universe," said study team member Fabian Walter of the Max-PlanckInstitute for Radioastronomy in Germany. "The black holes in these younggalaxies are much more massive compared to the bulges than those seen in thenearby universe.? The upshot:"The implication is that the black holes started growing first,"Walter said. The nextpiece to place in the puzzle will be to figure out exactly how black holes andcentral bulges affect each others' growth and how the bulges eventually racepast the black holes to become more massive. "Wedon?t know what mechanism is at work here, and why, at some point in theprocess, the 'standard' ratio between the masses is established," Riecherssaid. Newtelescopes currently in the works, including the Expanded Very Large Array andthe Atacama Large Millimeter/Submillimeter Array, will be key tools in solvingthis mystery, Carilli said. GreatestMysteries: How Did the Universe Begin?